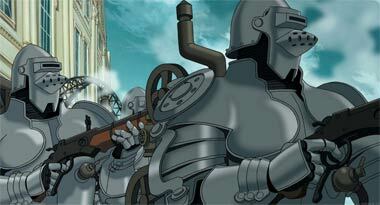 Anime grand-master Katsuhiro Otomo's magnum opus set in Victorian-Era England is expensive looking and opulent. Ten years and $22 million in the making, this big film deals with big issues — the misuse of scientific progress for war and human suffering, profiteering, and manipulation of science by government powers who do not understand the forces they are playing with. Fortunately, all that talk doesn't get boring, as there's an amazing amount of action, driven of course, by huge, hand-wrought machines pumping steam and popping rivets, valves and pressure gauges. Every moment is spectacular-looking. Don't miss this one! 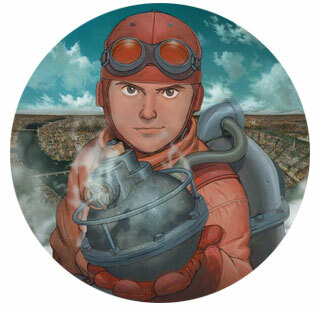 Below: Steamboy is anime ala Victorian style. 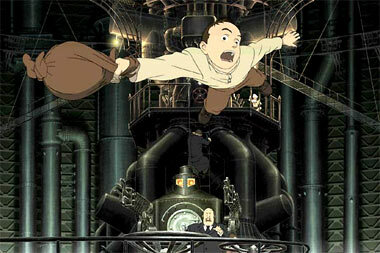 Not your typical anime soundtrack, as for starters, it's American artists scoring a Japanese production with composer Steve Jablonsky leading the way. Jablonsky makes his debut as a main composer and he does so with brilliance, creating a gorgeous theme that he works into the score as often as possible. 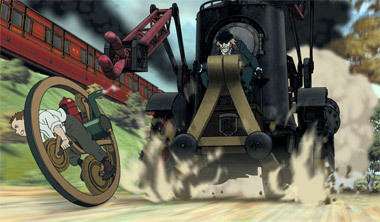 The music is awesome, capturing the flavor of each sequence from the film, along with quite a few fast-paced driving themes (We were particularly enamored with "The Chase" and "Raid By The Airship" as being the highlights). If you like the works of Hans Zimmer, you'll feel right at home in this Remote Control/Media Ventures production that has all the hallmarks of their other well-known scores (Tears of the Sun, Pearl Harbor, Pirates of the Caribbean, etc. ), which use a full orchestra with a subtle sprinkling of electronica. 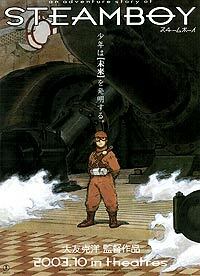 Below: The Japanese poster for Steamboy.